The Standards – These are places that are on everyone’s “to do” list; but they got on all those lists for a reason – they’re worth doing! 1. Pat O’Brien’s – Known for its famous dueling pianos, Pat O’Brien’s is probably the most famous bar in New Orleans. 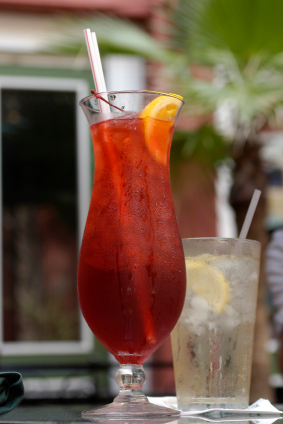 Located in the heart of the French Quarter, their Hurricane* is a must try. Have one of these concoctions in the central courtyard and then use the locals’ secret and return the glass to the bar and get some money back. The piano bar is located on your right after entering from St. Peter – if there’s a line, it’s completely worth the wait. 2. Chefs John Besh and Donald Link – Chefs Besh and Link are two of the most famous chefs working in New Orleans. Chef Besh is a seafood master with three restaurants – August, Domenica and Luke. I highly recommend Luke; ask for a seat in the back room, where you can watch the chefs work in the glass-enclosed kitchen. Chef Link is renowned for his work with all things pork. His flagship, Herbsaint, is a Cajun take on a French-American bistro. For my money, I prefer Cochon (which means “pig” in French) where, not surprisingly, pork is a featured ingredient and the chefs highlight classic Cajun and southern cooking. 3. 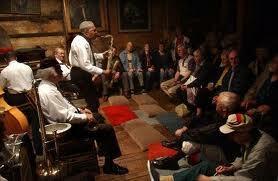 Preservation Hall – The most famous jazz hall in New Orleans. Go there any night of the week after 8:30 pm to hear traditional New Orleans music. There may be a cover if a bigger act is playing. The hall is a small, intimate room that seats about 50-80. No place like it in the world. 4. Mother’s – One of, if not the most, famous places to get traditional New Orleans food. It may not look like much but there’s almost always a line. Their most famous Po’ Boy is the Roast Beef Debris (a New Orleans term for the bits and pieces of roast beef that fall off while it’s cooking and sit in the juices; very tasty). 5. Antoine’s – One of New Orleans’ oldest and most revered restaurants. Ask the waiters to guide you through the menu and you’ll do no wrong. If it’s not too crowded, ask your waiter to show you through the back rooms to see a plethora of New Orleans historical memorabilia and catch a glimpse of one of the U.S.’s largest above ground wine cellars. 6. 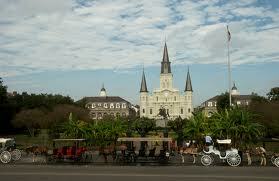 Jackson Square – Cool place to walk around either at night or during the day. In front of the St. Louis Cathedral, Jackson Square is a giant garden. Surrounding the garden are dozens of street merchants who sell everything from New Orleans art, caricatures, or will read your fortune with tarot cards and crystal balls. 7. The Royal Street Stroll – Walking slow is a New Orleanian’s favorite pastime and there is nowhere better to do it than Royal Street in the French Quarter. Start your walk from Royal and Canal, heading into the French Quarter. Enjoy the plethora of art and antique stores that line the street. 1. 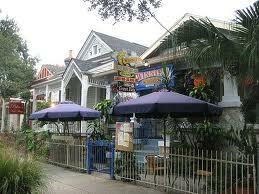 Frenchman Street – Walk down Bourbon St. and cross over Esplanade Ave. to get to Frenchman St. This is the locals’ Bourbon St. and has some of the best jazz clubs and bars in the city. Visit Snug Harbor on Fridays to see Ellis Marsalis or Mondays to catch Charmaine Neville. 2. Domilise’s – This is a local gem – tourists rarely ever make it out to Uptown to taste one of New Orleans’ prized culinary possessions. It is arguably the most famous Po’Boy shop in New Orleans (and a favorite of Archie, Eli and Payton Manning). You’ll need a cab or rental car to get there. Go with the fried shrimp or fried oyster Po’ Boy, you won’t be disappointed. 3. Drago’s – The original Drago’s is located in Metairie’s Fat City neighborhood, and a visit there is highly recommended. However, if you can’t make it that far off the beaten path, head to the Hilton Riverside at the foot of Poydras St. and you’ll find the original’s sister location. Known as the “Single Best Bite of Seafood in New Orleans,” the Charbroiled Oysters are out of this world delicious. Order a dozen and you’ll thank me. 4. Magazine Street – Not many tourists make it to Magazine St. since it’s outside of the French Quarter, but the locals love it. The street runs the entire length of the city, but the best spots are located on Magazine St. between Jackson Ave. and Nashville St., where you will have access to a wide array of shops, restaurants and bars. A local favorite is the Bulldog, specializing in unique microbrews. Hi Joe: I have one grandson that graduated from Tulane and a granddaughter who will graduate next May. They gave me a list of where to go and it is a match for yours. People should plan on coming early to New Orleaans and staying over to make sure they visit them all. And, don’t forget the World War II Museum.